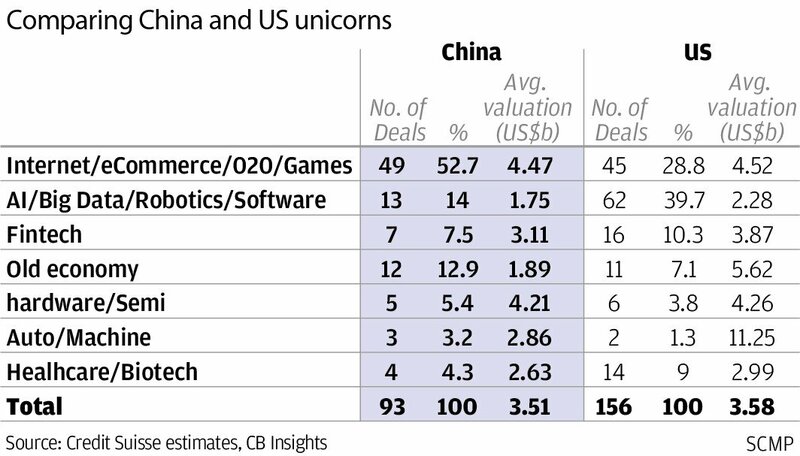 In a report released on Tuesday titled “China Unicorns, preparing to gallop”, Credit Suisse said that although China accounted for nearly one third of the world’s 326 start-ups valued at US$1 billion or more, its share of unicorns in sectors requiring more advanced scientific research capability such as artificial intelligence (AI), big data, robotics and software was just 14 per cent, compared to 40 per cent in the US. But the gap between unicorns from the two countries specialising in AI is expected to narrow in the next three to five years, said Vincent Chan, managing director of research, markets for Asia-Pacific at Credit Suisse. Chan said with the rolling out of 5G mobile network in China, the market potential for AI-focused companies will grow on the mainland, as they could potentially participate in the development of the network infrastructure. China is expected to be the first country globally to roll-out 5G in 2020. 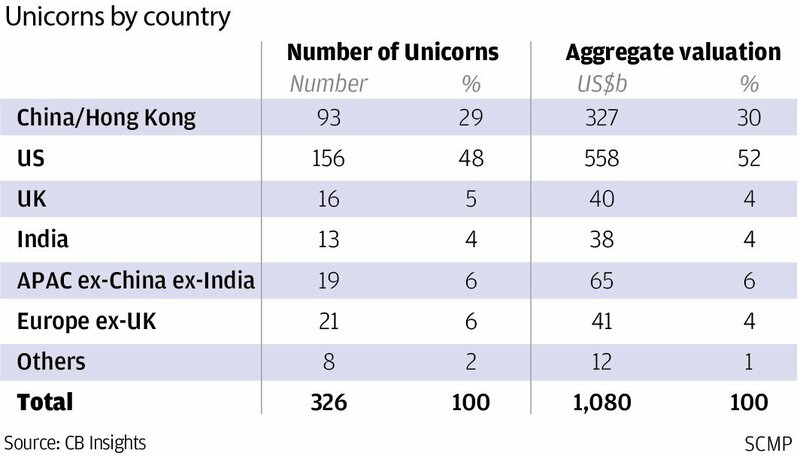 Even in terms of valuation, China accounted for only 30 per cent of the estimated US$1.08 trillion plus combined valuation of all unicorns globally. In the report, Credit Suisse said that nearly half of the country’s unicorns were still dominated by internet and e-commerce companies because they are driven more by business model innovation, which takes advantage of the nation’s large, fast-growing but fragmented consumer market. These unicorns include BeiBei, a maternal and infant products e-commerce platform; 17zuoye, an online education platform offering smart homework solutions; and the mega-unicorns of Didi Chuxing, an app-based ride-service valued at US$56 billion; and Toutiao, China’s largest news aggregator valued at US$75 billion. Serena Shao, Credit Suisse’s head of China health care research, said she expects the next 10 years to be the “golden age” for Chinese health care companies. “In the next 10 years, China will have an additional 100 million more people aged 65 or older. There is a lot of unmet demand in China’s health care space like better drugs and better [delivery of] health care services,” Shao said, pointing to the potential of more unicorns emerging from the sector. China’s R&D investment as a percentage of gross domestic product has risen quickly in recent years, reaching 2.1 per cent in 2017, from 1.2 per cent of GDP between 2000-09. But that share is still much lower than smaller economies that invest heavily in technology, such as Taiwan, Japan and South Korea. 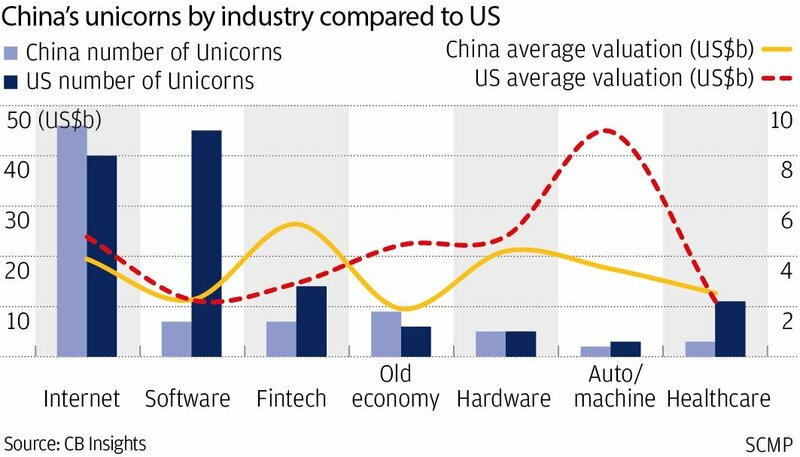 Despite its expectation that the internet sector will still dominate Chinese unicorns in the future, given the increased R&D spending in the last few years, Credit Suisse said it expects more technology-focused unicorns to emerge from China.